VMware Workstation features the ability to run multiple operating systems on the same PC without the need to partition the hard drive, or rebooting. Users can isolate and protect each operating environment, and the applications and data that are running in it. It allows users to interoperate among each of these operating systems, including full networking, device and file sharing, and cut-and-paste capabilities, and undo changes made in a given session. It allows operators to encapsulate and manipulate each operating environment, and have the ability to roll back and restart an application, or move an environment among differently configured machines. Unfortunately this application has become a bloatware. On my linux box vmware service takes four seconds to run. Then vmware itself starts in approximately 12 seconds. Then in order to run my VM it does something for several seconds. I.e. over 25 seconds for nothing. Meanwhile VBox does that all in mere 3 seconds and my VM is ready in just 8 seconds. Thank you but no thank you. 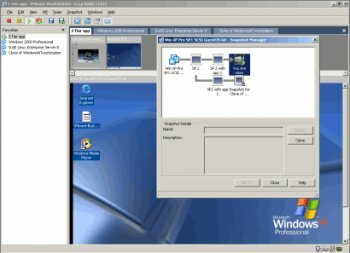 I stopped using VMWare WS five years ago and never looked back. It's a perfect virtualization platform, but recent workstation releases have become kinda bloated. VMWare is slow to start, the installer thrashes you system for minutes before VMWare gets installed. Still the best. Although VMWare Player is now free, to compete with other virtualization applications, VMWare Workstation has awesome capabilities that make it well worth the reasonable price they charge for it. Plus: it runs every application I need to run without difficulty and plays music clients better than virtualbox. Drag-and-drop is convenient (when it works properly). Minus: eats up a lot of my memory on my 2 GB system so it is more difficult to multitask when I have a browser and other applications running along with it and usually eventually have to reboot to get all my performance back. I plan on getting a 4 GB system soon but it is a shame 2 GB isn't enough anymore unless you only run 1 or 2 sizable applications. I've always stuck with VMware Workstation. Now that the VMWare Player is free and can now create VMs, is is tempting to switch to it, but I do love the snapshot and clone features. I tried VirtualBox, but it wasn't for me. In all benchmarks I've seen the two are comparable enough for it to not make a difference. However, I'd be VMWare's experience has its benefits in real performance. confused by rojs' review. Have you used VMW or listened to someone who was paid to use it? In a 14k sized co. why Workstation and not ESX? Virtualbox has now matured into something useable while VMWare continues to be a bloated VM solution and it often complains about errors. "Are you kidding me? I wouldn't use that bloated buggy crap if you paid me and I AM being paid for that." VMware Workstation - Not recommended by people who aren't doing what they're being paid to do.